Kolkata, 08 September: CONGRESS will embark on a march to West Bengal secretariat Nabanna at 1 pm on Tuesday to protest the alleged deterioration in the state’s law and order and atrocities on Opposition political workers by the police and ruling Trinamool Congress activists. 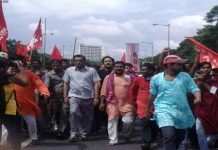 The march will commence simultaneously from Rani Rashmoni Avenue near Esplanade, Howrah railway station and from near the bus terminus at Satragachi. Congress sources said that state Congress president Adhir Ranjan Chowdhury and senior leader Pradip Bhattacharya will be in lead at RR Avenue, Amta MLA Ashit Mitra will head at Howrah station and Jalpaiguri MLA Sukhbilas Barma will be in charge at Satragachi. Mr Chowdhury told a Press conference on Monday that all the state level leaders and workers have been urged to participate in the march. He said that from amongst the marches a delegation led by Pradip Bhattacharya would go to Nabanna building to serve a memorandum to the state’s director general of police GMP Reddy. He alleged that despite being informed several days in advance, the DGP on Monday called him up saying that the Bengal police directorate had been relocated to Bhawani Bhavan in Alipore and hence, the Congress delegation should go there to serve the memorandum instead of to Nabanna. 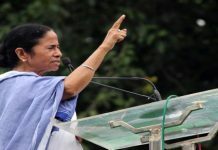 “But since the DGP’s office is still located on record at Nabanna, we will go there,” the state Congress president said, warning that if the police try to forcibly stop the marchers on Tuesday, Bengal Chief Minister Mamata Banerjee and her administration would remain solely responsible for any untoward situation. 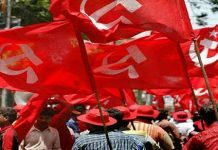 The Congress Nabanna march comes close on the heels of a similar agitation by the peasant wings of the Left parties on 27 August that had resulted in massive street fights between the Left supporters and the police in Kolkata, Howrah and Satragachi.